AEG announced Wednesday that their contract was renewed for five years longer than originally planned. Are the Coyotes staying or leaving? AEG Facilities announced last Wednesday that their contract for managing Gila River Arena has been extended until June 30, 2026. What does this mean for the main tenant, the Arizona Coyotes? The city of Glendale pays AEG $5.6 million a year to manage the arena, which is offset by the shared arena revenues which include big name concerts. There are still three years remaining on the original contract signed in 2016. Glendale's City Manager, Keven Phelps agreed to the extension with the condition that AEG install a new high-tech LED lighting system in the arena. Phelps is pleased with AEG's performance over the last two years. The city gained $1.6 million after the first year and another $1.68 million after the second year, with expectation estimates at just $1 million. With the $5.6 million paid to AEG for management fees the net loss was $4 million the first year, and $3.92 million in the second year. Compare that to the net losses of just under $10 million in fiscal year 2015 and an astounding $22.8 million loss in 2011, and the picture is clear that AEG is doing a fine job. Phelps has stated that AEG has "brought a new level of sophistication" to managing the arena. In the last year, Gila River Arena has put on more concerts, sold more tickets and collected the highest gross ticket sales since 2009. 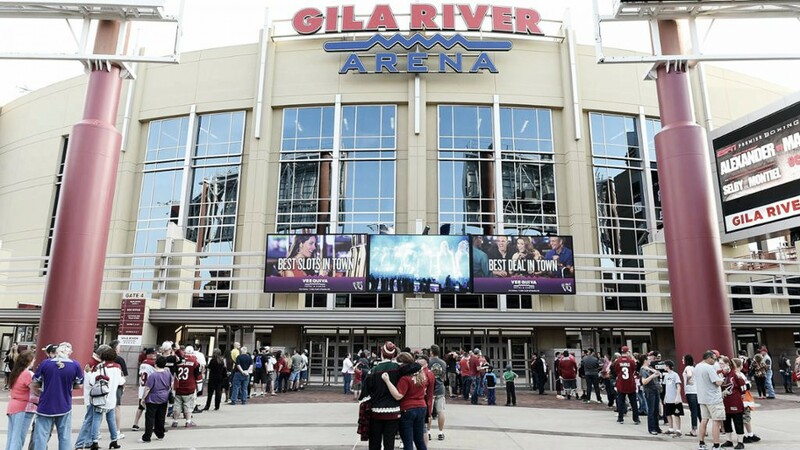 Dale Adams, who manages the arena for the Los Angeles-based AEG wanted to cash in on the large potential for Gila River Arena, Westgate Entertainment District, and the city of Glendale. Add in that GoDaddy founder Bob Parsons' YAM Properties company recently purchased the Westgate Entertainment District for a cool $133 million and it's a no-brainer that AEG wants to be involved. Adams mentioned that the Coyotes' decision to leave didn't have any affect in their decision to continue being involved with the arena. "We don't even think of that,", he said. "What happens, happens." The Arizona Coyotes are on a one-year lease presently and any word on a proposed new East valley arena for them hasn't been mentioned for some time. The team had an arrangement with Arizona State University to build an arena and share it with them but that fell through in February of 2017 when ASU decided against the project. Speaking of ASU, the former COO of Arizona State Athletics who assumed the athletic director role in 2012 and went back to his alma mater, the University of Texas, in 2013... Steve Patterson was fired less than two years later and returned to the Valley to take over the Coyotes. On July 3, 2018, after just a year on the job with the Coyotes, Patterson announced he was stepping down. He will resume his role as president of Pro Sports Consulting and focus on other business endeavors. Ahron Cohen took over as CEO and president of the hockey club. He joined the Coyotes in 2015 as the team's general counsel. He's been serving as COO, overseeing business operations, legal matters, strategic arena planning and government relations. It's not certain what arena planning expertise Cohen possesses but it's very obvious that Patterson's experience and talents in this area will be missed. So, why did he leave? Barroway became the majority owner of the Coyotes in December 2014 and the sole owner in June of last year. The fact that Andrew Barroway is now seeking cash for his team is not surprising, and either is the selling price at $500 million. With the expansion Vegas Golden Knights joining the NHL last season with an expansion fee of $500 million, NHL Commissioner Gary Bettman believes there is no team worth less. The news that Seattle is seeking an expansion team as soon as it can renovate Key Arena to NHL standards has the present NHL owners rubbing their hands together since the suggested expansion fee may reach $650 million. So it very well could be that Barroway is considering selling the team and moving on with the losses he's incurred. Since it appears that Seattle will be an expansion franchise there was news that Houston is also very interested in adding an NHL team, as is Quebec City. The Carolina Hurricanes were sold to Tom Dundon who now has 61% of the team while former owner Peter Karmanos retained the remainder. Dundon has signed an agreement which states he cannot move the team for seven years... so the Hurricanes are not going anywhere. We have heard the same profound statement from Bettman in the past that the Arizona club is not moving either... yet explain to me why Patterson left, Barroway wants to sell almost a majority of the team, and there is no new arena plan in place. It is food for thought. Unless the team can come up with a solid new arena deal (and it hasn't happened yet) or decide to bite the bullet and stay at Gila River Arena since the new ownership of the Westgate Entertainment District may increase the attendance at Coyotes' games, there is nothing but questions without many answers. What all this means is IF (and it is just that...) the team is sold and moved to Houston or wherever the tragedy would be this team is really starting to gel. President of Hockey Operations/GM John Chayka has done a marvelous job in forming a more competitive team with trades, free agent signings and signing his star players to extensions. It would be more than a shame to not be able to see the team night-in, night-out as it progresses upward. Perhaps if the team decides to stay put in Glendale the attendance will increase if the team starts winning and at least gets back to playoff competition. Nothing brings fans into the rink more than a winning team. The average attendance over the last four seasons for the Yotes is only 13,228 or 77.25% of capacity. The overall opinion is that if the team gets a brand new arena in the affluent East valley the fans will flock in. Look at the Arizona Cardinals, they have had sellout after sellout since they moved into their new stadium just up the road from Gila River Arena. Their attendance has been at 99.4% of capacity over the last four seasons. They had one good run to the Super Bowl and yet every game sells out. Many factors like how many games are played and that the NFL mostly plays on Sundays when traffic is minimal affects that. The Coyotes play in Glendale, AZ and the drive for many East valley residents on a weeknight with a 7pm game start can be a challenge. Yet, no new arena information has been talked about or even rumored since the ASU joint venture was trashed. There's some talk of building a new facility on Tribal land but so far nothing has transpired. Keep in mind building a new arena would take at least two years to erect even with the favorable weather here in the desert. To look at the two scenarios of getting a new arena built, or staying indefinitely where they are now makes one wonder what is going to happen. The only sure thing is that AEG will be managing the building the Coyotes are leasing presently on a year-to-year basis at this point. How much longer can owner Andrew Barroway sustain continual losses? He's a businessman and knows how his bottom line works. Right now his bottom line as far as the Coyotes is concerned is filled with red numbers and he could be getting tired of it. As a loyal Coyotes' fan I want nothing more than to keep them here in the West valley. It just doesn't seem viable, and that's a shame. If they must move it makes no sense that someone like Bob Parsons who is worth $2.6 billion (with a 'B') would invest in buying the Westgate Entertainment District and be okay with losing his prime NHL tenant. Who will purchase items in those shops, or eat at the restaurants or drink in the bars? There aren't enough concerts to sustain a profit doing that. Hockey fans are what is needed... and hopefully they'll still have a reason to go to Westgate. Who knows, maybe Mr. Parsons is interested in buying the team. I mean after all... he will be the landlord. What do you think is going on with the Arizona Coyotes as far as where they will play? Will they move to another state, or just over to the other side of town? Let us know in the comments section below.